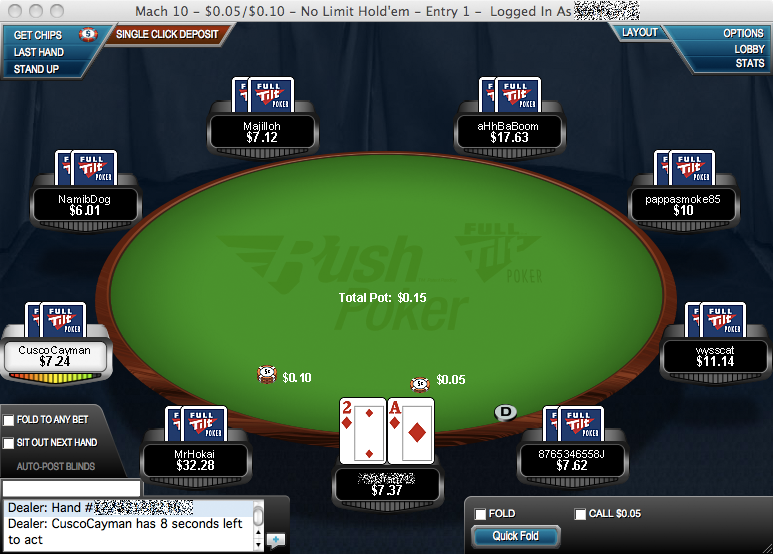 Full Tilt Poker launches new innovative game Rush Poker! Rush Poker is a new poker game just released at Full Tilt Poker; this is a new and completely different way to play poker and probably one of the most innovative things to happen to poker in many years. The idea of Rush Poker is extremely easy, insted of playing at one table you join a pool of players playing at many tables. When you are finished playing the hand you are moved to another table where a new hand is begins right away. You don’t even have to wait until it is your turn, you can just click on “Quick fold” and fold the hand before it is your turn (players at the table won’t know you folded until it is your turn) and you will be transferred to a new table without having to wait for the hand to finish. Rush Poker is a game that is extremely fast and fun. I think it has more like a slot machine or black jack than a regular poker game. Players play more tight and many players fold when they don’t have a really good hand. It is also not very easy to analyze the players you play against which I enjoy doing. So for me Rush Poker is a fun but very different game that I am sure many players will enjoy, but I don’t see it as a substitution for multi tabling on Texas Hold’em or other poker games. I think it is great to see that a big company like Full Tilt launches a completely new way of playing poker! Who will be next to innovate the igaming industry?